The Maori Gods were with us today as the sun shone down upon us and i got up today feeling refreshed and rully revitalised after a good night's sleep so i was prepared for today's events which was the big drop!!! Just like the Nevis Bungy Jump i wasn't feeling nervous at all but just excitement as were about to jump 12,000 feet from a plane. After getting into our jump suits and doing the happy video profile introduction which in the end i looked like a Chinese Gangster rapping. 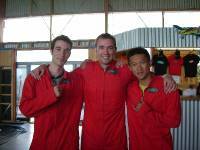 I met my tandem jump buddy 'Damien' who i'd be harnessed to and i met my video guy which turned out to be a very hot videogirl called 'Corrine' who would also jump with us and film my descent down to Earth. We all got on the plane and i was the last one to get on which meant iw would be the first one to jump off so there was no option of turning back. As we got to 12,000 ft it was time for me to put my goggles, the door opened opened and a massive rush of wind came flowing across my face and then Corrine got up and walked across my path and grabbed onto a bar outside the plane and stood there waiting for the moment when Damien and i woud fall off the ledge. It was such a rush falling through the air spinning left and then right whislt looking at the ground and then all of a sudden the parachute opens up and you're floating down with the occassional 360 degrees that Damien made. 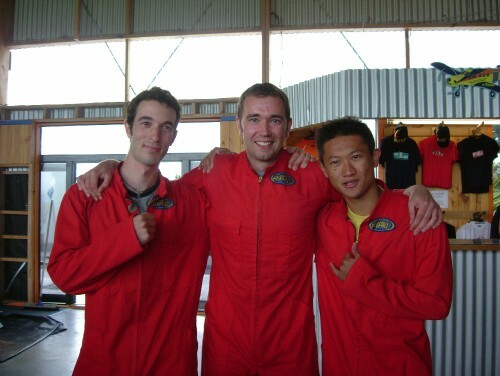 Sky diving was definately an experience i will never forget and something i would love to do again at a higher height. After our skydive Mark was not feeling to well and when we got back to Taupo we decided to hit te termals rocks again woo-hoo!!! But Mark was still feeling under the weather so it was just me in the pools and after my leisurely swim in the river we went and played a bit of frisbee. Which attracted the attention of a big rotweiller and consequently he left big bite marks in the frisbee but the dog was harmless and very cute.